Long live the start Menu! It seems Satya Nadella is wasting little time reversing Bulmer's catastrophic 'innovations'. Sky Broadband, Wired, Wireless, VoIP, 1 Mac, 2. Hackintoshes, 1 PC, 2 HTPCs, iPhone, iPad, OS X, Windows 7, Hate and 8 rhyming is not an accident! Who cares, it's a start menu, I spend 0.1% of my time on the computer (if that) in the start menu. I honestly don't see what all the fuss is about. What's good about Aero, does it make users more productive? "Windows fanboi refuses to acknowledge Windows issue / drawback / problem / fault / bug" - Shocker! If you're an employee declare it. If not, please stop defending companies that don't deserve it. They need more criticism if lacking. The Start menu may or may not be a good thing per se, but to reject it because you don't use it is narrow minded. Oh and not criticising them for one as an excuse to not criticise them on something else? Come on! I don't like the tiles on the start screen, so having them in a start menu is no better. If it is possible to get away from the Modern UI look then fine, other wise may as well stay with the menu i use. They did a similar thing with Office 2007 in that they got rid of the old DD menus in favour of a 'ribbon', which played hell with productivity. Great for the training sector, I'll bet. I say keep the menu and if necessary make it an on/off option. I am simply highlighting the sheer stupidity of the whole "Windows 8 is rubbish" "Microsoft making U turn" articles which revolve purely around a little feature called the start menu/screen and what Microsoft are doing with it. It is totally ridiculous! If Microsoft bring the start menu back, depending how, I may use it on my desktop OS (I certainly won't on my Surface unless it is superior with touch screen also), but either way it doesn't matter. The start screen is excellent technology in the fact it works fine on Desktop, Server, Gaming, and Touchscreen/Handheld platforms. I learnt very quickly to cope with it, there is no reason why anyone else shouldn't be able to either. Microsoft offer the taskbar and keyboard as other ways to launch programs, there is no need to dismiss a whole OS because something rather minor has changed. I learnt very quickly to cope with it, there is no reason why anyone else shouldn't be able to either. That applies to anything, and as with anything opinions vary. Microsoft offer the taskbar and keyboard as other ways to launch programs, there is no need to dismiss a whole OS because something rather minor has changed. I didn't dismiss the whole OS, but I equally don't dismiss others' negative opinions of something. If there are negative opinions, we should ask why. But you might work for a Microsoft partner. Or is Bill Gates pretty much doing a Steve Jobs without becoming CEO himself? Note: I don't lay turf for anyone. astro or otherwise, all views and opinions expressed are my own based on experience. Coping with sounds very much like saying it a lesser solution than they replaced, but I can use it. I can drop down to Linux command prompt when required - doesn't mean I won't jump up to decent GUI when available to do the one off jobs that aren't worth scripting. I actually don't think it is a lesser solution, certainly, I've just been doing some work on Windows 7 computers and found it harder to get to certain things on them. The joy of the Start Screen is you hit the start screen and start typing, and its matching/searching capability is far superior to that of Windows 7. Not only that but you can get a lot more pinned favourite/regular apps on the start screen than on the menu. Ever clicked someone's start menu and seen loads of accidentally and bogus pinned stuff at the top? Seems if you like to add extra options to your computing. No need to quote if you are replying to my post. Must be something that is common with W8, extra steps required. Huh? Less steps required, measure it in clicks, keyboard presses.. I presume you call them steps. If it is taking more steps, you're doing it wrong. If I pinned all the apps/folders I used regularly, I'd fill the width and then some (but I have always used desktop for that sort of thing). It's funny when I set up Windows 7 task bar as I like (more like Win2K/XP), I can see Office Communicator contacts coming in - yet the default settings everyone complains they don't see them, such is progress. Searching for applications is great - if you know the name you are searching for. If I am looking for a rarely used application I don't always know what they have called it, but will have a good idea which application it was installed with - so immediately can home in fairly fast (or workout not installed as quickly) This is from someone who starts a lot of apps (especially Office) with "Windows Key" + R and types the executable name. I used a menu add-on. Office 2007 works as if it's pre-2007. The only complaint is that I wish I'd gotten 2003, as I lost the export to web feature. Discontinued with 2007 and replaced with another program (Sharepoint?). No matter. I got lots of Excel macro experience creating a workaround. Discontinued with 2007 and replaced with another program (Sharepoint?). tbh, I've never understood the reason for Aero - other than MS considers it makes their screen "prettier"! It certainly appears to be a resource-hogger. Additionally, it causes delays when I start up a proggie that is not compatible with it & it has to revert to a conventional display! Removing Aero in Windows 8 was a great move. Just one of the reasons that it is so much less of a resource hog, and is more responsive, than Windows 7. Unfortunately some Linux distributions seem to value a "pretty" interface over function - and they don't even get "pretty" right. In addition, there are a lot of services which can go. Hmm yes that is quite true.. Must admit I think its been years since I launched an application that needed it disabling. Must be running some bespoke stuff there! You're not going to like this but disabling a few services doesn't really make that much difference - 1-2% at most? - services are optimized out of the box. Also, unticking some of those boxes in your screenshot boxes can make your system perform worse, depending on the graphics card it has, be careful with that. Vista had and still does have some quirks built-in to the operating system, the UAC prompt is a lot less reliable at coming to the front on Vista compared to later versions, but assuming it is running on well balanced hardware it runs relatively OK, then again so did XP to some degree. 7 was a definite improvement to address those quirks, and as usual 8 an improvement again. You should have taken up that upgrade offer, I think you would have been very pleased, even if you needed to run the stardock or something. Grannies sucking eggs and all that. Every Windows operating system is tweakable. I have tested each of the disabled services and tick boxes individually to come to a slick setup. About 1.0 to 1.2GB of 4GB memory used five mins after boot (no, not the cached memory - that's different). Of 162 available services, 39 (24%) are started. That 76% of available services not running. Of the 39 running ones, 11 are manual, meaning they only start when some other program or service starts them. Meaning they stay off until needed, and reset to off after reboot. 59 or 36.5% of services available are disabled. Vista is a fine OS if you tweak it and it's stable. That 1-2% may or may not be accurate. When one tweaks tens of 1-2% scenarios, we're talking 20-40% or more. Oh and one of those tick boxes (I forget which) made an immediate, noticeable difference to memory usage. In the realms of 50-100 Meg. Probably one of the fades, or the background image one. Edit: Oh and the scheduled tasks are all gone too. Having the usual Windows icons on a Metro application certainly looks weird at the moment. Grannies sucking eggs and all that. Every Windows operating system is tweakable. Absolutely! That is what makes it so good, Microsoft give you the choice. Some people abuse it (not referring to you - more people who either get malware installed through their own foolishness or otherwise mess up the system badly and then say Windows is ****), but those who know how to use it properly can reap rewards. Absolutely! That is what makes it so good, Microsoft give you the choice. Excuse me, but stop it. Stop it! Stop spinning every post into a 'MS is great' moment. If it was we would not need to tweak. Many services are not necessary for typical users. Ergo, they are bloatware. Tweaking is not the result of a manufacturer giving their customers the choice. It is the result of a manufacturer not releasing the optimum product. MS and choice does not ring true with regards DEP, licensing, and changes to products which impact on productivity (such as the MS Office ribbon - the latter of which is not optional). It does not give 'choice' to users. It gives users a product and those with knowledge and patience end up having to make the product more efficient, more safe, and more stable, by tweaking it. If MS were great, they wouldn't release sub-standard products to the public and force them to test them for weaknesses. I am sorry Camie but you're wrong, all of those services are there and running for valid reasons, you have chosen to disable and tinker with them because it might fit your bespoke situation - but that certainly does not apply to most. If you adhered to well informed Microsoft advice you would know not to fiddle with system services because it may result in unpredictable and hard to track down problems. The only person on this forum that talks about tweaking (aside from GUEST_AGAIN) is you, and I am not sure I would call unticking a few checkboxes and disabling services tweaking, there is a bit more to it than that. It is like back in the days when people would faff around with paging file settings - it's not necessary any more 99.9% of the time, and yet people still do it thinking they know better. You should be thankful Microsoft are giving you the options to faff with these settings - they could revoke it and behave like Apple/Google, who are far from perfect, and on the flip side, could be like an open source OS, and I doubt you are going to be recompiling a Linux kernel any time soon to do your "tweaks". The fact remains if you want the most efficient Windows operating system on your machine you should have upgraded to Windows 8 - and put the stardock menu on it if you really hated Metro so much. Your system would have run far better than it does now, but you obviously didn't want to spend the £25.00 at the time. I'll just have to disagree with your way of thinking on this one. 1. Readyboost - Enabled as default (Automatic started). If you know what readyboost is, you would know that it is useless as a default option, unless the user is aware of what it is. If they are aware of what it is, they will have planned additional hardware to suit (which begs the question, why didn't they plan additional internal hardware to suit in the first place?). It is useless, unless the system in question is lacking in suitable hardware, in which case why is it lacking in additional hardware? 1.1 - Bad Planning of hardware setup - Possibly the user has been badly advised. Is MS allowing for this? Surely MS is not planning that PC builders will build with less than ideal hardware? 1.2 - MS anticipates that hardware will not be able to cope with software demands. Ergo, it is being badly released (i.e. mis-reporting of hardware requirements), or is expected to place too much demand on hardware, but they haven't worked out why (poor coding). 1.3 - MS anticipates that the OS will be used in upgrade situations and existing hardware will not cope with the requirements - so MS is giving customers the option to not upgrade their hardware to cope with the software demands? Unlikely. They don't generally do this. 1.4 - MS anticipates that the OS will be installed on laptops, and typical laptops don't possess the facility for ideal hardware to run the OS, so are making readyboost available for them. Possibly, but, again, why would MS design for existing hardware, when it easier to market it for future hardware? So we return to the point. Is readyboost for all systems? If so, why? Why not market the OS with higher hardware requirements? If not, why is it enabled by default? 2. DNS Client - Enabled as default (Automatic Started). Completely unneeded in single PC situations. Maintaining one requires that it remains up to date. Easier to disable it and let the DNS servers on the router manage it all. In some cases disabling improves web browsing speeds. 3. Distributed Link Tracking Client - Enabled as default (Automatic Started). Useless in single PC situation. Per 2 really. In fact if we go down the line of single PC, no Internet Connection Sharing, we can disable all manner of services. , you have chosen to disable and tinker with them because it might fit your bespoke situation - but that certainly does not apply to most. I put it to you that the majority of non-tech users do not require most networking services (single PC setup) and many will not require ICS as a result. A more simple setup would have been a single PC / multi PC option from the beginning, rather than this slipshod one size suits all manner. If you adhered to well informed Microsoft advice you would know not to fiddle with system services because it may result in unpredictable and hard to track down problems. Hard for whom? Non-techs, who should not have said services enabled in the first place? Techs who can work it out anyway? The only person who talks about MS in such high regard is you. 2 to 1 so far. Lest you forget, this is a technical site, and as I mentioned before 'grannies sucking eggs'. If you want a site where no one fiddles with you precious Windows, go to the Windows fanboi forum. and I am not sure I would call unticking a few checkboxes and disabling services tweaking, there is a bit more to it than that. It is like back in the days when people would faff around with paging file settings - it's not necessary any more 99.9% of the time, and yet people still do it thinking they know better. There are in excess of 200 tweaks that I have done on my system. Services, processes, tick boxes, registry alterations, hardware tweaks, disabling motherboard settings that are not required. It all adds up, but the vast majority (more than 90%) off the tweaks are MS Windows, naturally. With regards your comments on pagefile settings, that's all you know about it. You don't tweak (if you follow your own advice), so how can you tell that it does or does not work? 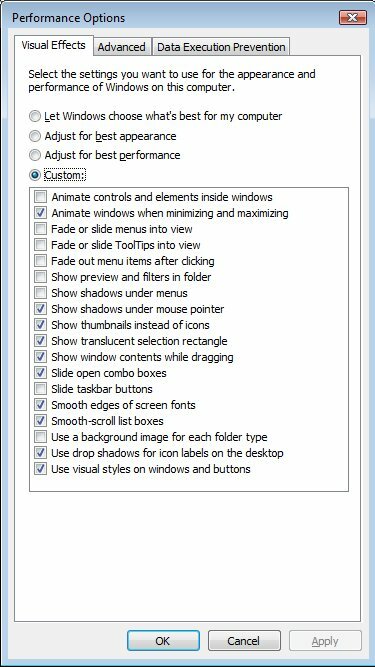 Are you seriously telling me that setting a static pagefile of a sensible size is better than having a dynamic one which resizes according to demand? Think about it. With the massive amount of disk space, it makes more sense now than ever before, and if you think that a pagefile is not necessary, think again. Are you reading back your posts before hitting the send button? I have the most efficient Windows operating system on my machine. That's the point. Indeed you will, and I'll disagree with you when you call for out of the box setups over customised setups, or when you sing the praises of MS over peoples' product needs or complaints. "Who cares. It's a Start Menu" - says it all really. You think that something is useful only if you use it. I think that any part of the system might be useful, but at least give the option to decide, rather than give me (and everyone else) all the useless stuff and take away the things we've been used to for 20 years. Respond to the users, and by all means give the IT fashionistas their toys, but allow it to be a productive tool too. No you don't. Windows 7 and Windows 8 would be far more efficient out of the box than your tweaked Vista installation. I'd have to say that I think you have misunderstood the operation of the DNS client service (note "client" not "server"). It is there to cache DNS entries on the local machine, avoiding an expensive network operation each time a DNS resolution is required. Remember that Vista was designed at a time when networks were far slower than today, particularly wireless networks. It is nothing to do with sharing the Internet service with other computers. DNS caching is considered to be such an important performance boost that many web browser clients include their own caching. But web browsers are not the only programs that need to resolve readable names to dotted quad addresses. Hold on... Are you categorically saying you think your tweaked Vista OS is a more efficient operating system than Windows 7 and/or 8 out of the box? The DNS requests are just piped up the hill to the ISP server (or in some cases, the gateway). The speed difference is negligible; there is no expensive network operation, and there's no local overheads. In the case of multi-PC environment, of course a cache is probably worth it. I personally noticed no difference between it being on and off. Therefore it is off. As a result there is a small saving of other resources. My tweaked system versus an untweaked 7, with all the same programs, and five years of service. Definitely. Win 8...I'll give a qualified yes, on the basis that it's impossible to prove either way, and you knwo that too. "Only in extreme situations should you disable this service as caching DNS lookups reduces network traffic and makes internet surfing performance faster." With a reasonably fast network you may well not notice the difference. But, as I said before, Vista was designed in the days of slower networks; and much of the world still has to put up with such a situation. Also, it is just good netiquette not to needlessly squander someone else's (the DNS server's host) resources (the DNS server). Anything that reduces network traffic, and the load on upline DNS servers, can only be a good thing. Nope, I don't agree. My ISP provides those servers for a reason. I pay them for their service. Nettiquette has nothing to do with it. How fortunate that not everyone, including those who run DNS servers, feel the same way. Otherwise the root servers would get a real hammering responding to every DNS query ever made. yeah common sense has kicked in, of course the media is as much to blame. I read dozens of articles stating the start menu was outdated, win8 interface is faster, superior etc. they all assumed new=good. sadly tho I think they keeping the 1990s styling. I am sure anyone can cope with it, but why bother when a superior interface exists? IF it is superior, it is not superior by a massive amount. Did you ever try a Windows 7 tablet? I have a Windows 7 tablet, and let me tell you, it is NOT easy to use. Unlikely, if ISP servers are caching. ISP servers are notorious for being unreliable. I think you miss the point. You say "why should I bother to cache DNS lookups on my computer?". Those running the DNS servers could equally say "why should we bother to cache DNS lookups on our server?". And if everyone did that the root servers wouldn't be able to cope with the overwhelming number of DNS queries they would recieve. But DNS is a distributed directory and works because every effort is made to avoid such a situation by caching results that are going to be needed time after time. The smooth running of the Internet relies upon the fact that those running the DNS servers act responsibly and make sure that they consume the minimum bandwidth and place the smallest possible demand on up-line servers. We owe it to other users to do the same thing with our computers and not selfishly squander bandwidth and the resources of remote servers by making hundreds of unneeded DNS queries. Well no I use a PC not a tablet. We not talking about tablets, we tralking about changes been made for the desktop experience. I get it, you like touch, you like windows 8, but dont start telling other people they are forced to change to touch, or a touch interface. As far as I am concerned microsoft are moving in the right direction and as I said before I will be having a go with win 8.1. I just applied the update and now my PC boots to desktop. BT's DNS servers have been a joke for years. Not really... I'm happy to take it though if its not too much more expensive. For the moment though, I use a keyboard and mouse 99.5%+ of the time, if not more. Tweaking is also altering a system by addition of external software in order that it performs in the way the end user wants. We know MS can't include every person's wish but if most of the world is used to "starting" programmes in a certain way and have been for years, why change that? We haven't all got the mental capability to remember the first letter of infrequently used prog's in order to type into a search facility. If you can be bothered to sit down and spend a few hours learning a new OS then good for you but IMHO the only people that gain are the MS partners who carry out the training of end users. Totally agree with you 100% on that one. Maybe I too will look at upgrading to Win8. by the way how do you access wifi settings on 8.1? What they also need to understand is that it's not just the Start menu, or the desktop, or the Metro bit, it's all those little subtle things they messed around with that just get in the way of the user. Under the skin is a very good operating system and things like the Task Manager tease with what could have been. But some of the changes are just stupid - why (for example) did the Wifi management get removed in 8.1? It makes life difficult and there's no obvious reason for it! Needing to drop back to the command line or drilling into the adapter settings just to change a password is a real backwards step and completely illogical. And there must be twenty similar things I hit daily. I'm not anti Windows 8 - I'm using it right now to type this and even have a touchscreen for the full Metro experience - but it does feel that design got in the way of the engineering and that the design side went for shiny over usability. Something as well, as far as I recall there is no manual for the windows 8 interface, It seems the way it works having to move mouse to corners etc. has all spread by word of mouth, via youtube etc. It'll probably be sorted in W9. Bit like Vista to W7. Vista was very flaky for myself but hardly any issues with W7. The next release will move even further away from the touch-first approach, allowing users to run those full-screen apps in windowed mode on the desktop. It�s a logical move, as anyone who�s been forced to run apps full-screen on a 27in monitor will tell you, but it�s also one nail in the coffin of that much-maligned Start screen. Combined (at last!) with the reintroduction of the Start menu � and one that neatly combines the Windows 7 text style with a Windows 8 tiled app section, like a mini Start screen � and you almost have an admission from Microsoft that forcing people into a brash new interface they hadn�t asked for was a colossal misstep. And following on from BB66's last post, many will now be wondering if Win10 will be a 'tick', rather than a 'tock', and will it flop on that basis..."Vista...Win 8...no, not three in a row for me" ?